Railway Preservation News • View topic - C&NW 284 saved; will be restored to operation! C&NW 284 saved; will be restored to operation! Post subject: Re: C&NW 284 saved; will be restored to operation! I have to say, you and Mark have made the world a better place. Please send my regards. Thanks for the kind words Sammy. Here is a photo taken earlier today at HVRM of Mark working on the "The Overland Route" slogan on the OTHER side of the car. Very labor intensive as I have said. Mark's photo from 12/13. Been a long haul but lettering nearing completion! The "Overland Route" slogan has been finished. Today Mark put some "special tape" on a number of pin holes in the roof of CNW 284 (see photo). I looked at the metallic looking tape and read "Scotch Brand" on the inside of the roll, but no other description. Mark was impressed with its installation and eventually will put some "mineral (box car) red" on it. Perhaps someone can advise if they recognize the tape. If it's on a roll, look at the inside of the cardboard spool. There may be ID info there. It kinda looks like metal duct sealing tape which is basically a soft, heavy aluminum foil with acrylic adhesive on one side. If that's what it is, you may have adhesion problems with painting it. Paint typically doesn't like to stick to aluminum without special treatment. Also, I'd have no idea how long the adhesive would last outdoors. It may turn out to be a good "temporary" patch, though. Keep us posted. I looked on the inside of the roll and all I saw was "Scotch Brand Tape" printed a number of times. No indication of what it might have been called. The outside (cellophane?) wrapper which would probably have advised, is no longer there of course. I believe Mark plans to prime it and then paint it. How that sticks to the "shiny" surface we shall have to see. Will of course, advise what he finds out. Mark states that he seal coated the tape on the roof using something called Pro-Flex by Geoseal. He says he brushed the clear sealer on and it was "kinda like a jelly" and acted as a primer. He then let it set for a full day before painting it. I was at the museum for a bit this morning, and took this photo. I wasn't at the museum today, but Mark reported that C&NW #284 has now been pulled out of the shop to make room for other projects. The car was spotted near the HVRM's depot and Mark took these two photos today. There are still a few things that need to be done including putting the roof walks back on, but the car is a wonderful Christmas gift to the members of the museum. Well done Mr. Knebel! Looks like Mr. Knebel is one productive and dedicated volunteer. You guys at HVRM set a great example in how to make a collection appealing and presentable in short order. The metallic tape patch may not be a permanent fix, but it is a good solution for the short term (10 - 20 years?) that looks fine and stops decay. While browsing, I noticed a car in background of this pic painted in a slightly different variation. Thanks for the photo. I have also seen cars lettered "Route of the 400 Fleet", so apparently the North Western used a number of variations through the years. Not sure of exactly WHEN these different "Route of......." slogans were used. Perhaps someone knows and could advise. Nice work, gorgeous lettering on a great car. And that set of signals is pretty cool, too. Your appreciation of the work on C&NW #284 is welcome. Thank you! 1. 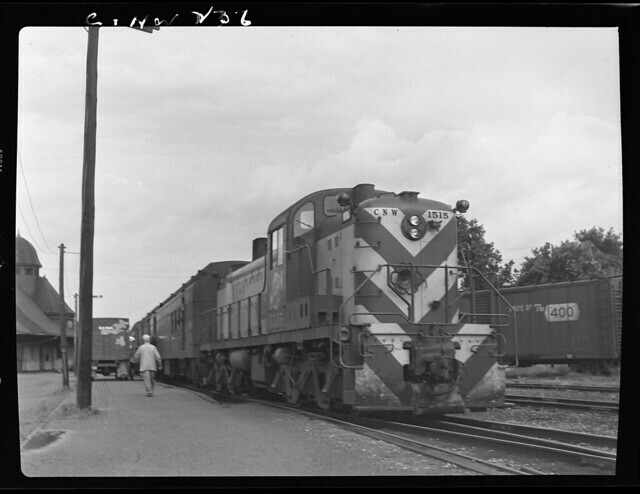 The three headed signal which appears in both photos is off of the Nickel Plate Road at Hibbard, Indiana where it was the westbound home signal protecting the NKP/PRR crossing at the east end of the Hibbard passing track. 2. The semaphore seen is actually an Erie Railroad upper quadrant TTO double semaphore (C&NW 284 is blocking the view of the lower blade). It is a US&S type S from the Erie's milepost 948 track 1. 3. The signal next to Grasselli Tower is an Erie/C&O three head searchlight signal (US&S style H) and was the eastbound home signal at Griffith, Indiana. All of these signals are operable off of the track circuits, although my guess is that the were not turned on yesterday at the museum. Let me take just a moment here to wish those readers here on Railway Preservation News, a most joyous Christmas! Last edited by Les Beckman on Sun Dec 24, 2017 3:22 pm, edited 2 times in total. It's taken a while, but member Tom Rainford and I finally hauled the sections of roof walk up onto C&NW 284 and put them into place. The first photo shows Tom working on putting a bolt into place on one of the corner sections of the walk while the second shot shows the repainted roof walk sitting on the cars roof. Didn't quite finish bolting all of the sections down, but will snug them up next week, weather permitting.